James J. Conner was born on November 26, 1847 to Thomas B. and Sarah (Wall) Conner in what is known as the "Dead river settlement," in Montgomery County. At age twenty, Conner studied law under Col. Jonathan Rivers and was admitted to the bar in 1871. He would practice law in Dublin for a number of years. He was later elected mayor of Dublin for two years and served as solicitor-general of the circuit for several years. 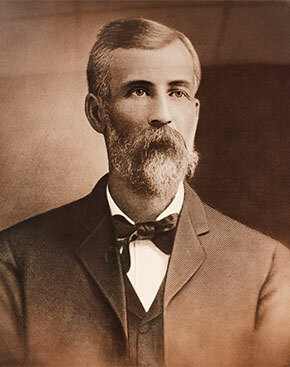 After marrying Lucy C. Ryals of Bartow County, on November 9, 1879, Conner moved to Cartersville where he continued practicing law and experimented with farming. He settled on a farm along the Etowah River where he used and promoted new farming techniques that helped ensure greater yield with less effort. Representing Bartow County in Georgia's General Assembly (1902-06), he introduced legislation providing for the establishment of the Georgia State College of Agriculture in Athens. Recognizing Conner's efforts in promoting agriculture, Governor Joseph M. Brown appointed him Commissioner of Agriculture in 1912 where he resided for the remainder of Thomas G. Hudson's final term. Conner would continue his service to the College of Agriculture as chairman of the board until his death in 1930. Conner Hall, administrative headquarters for the College of Agricultural & Environmental Sciences, was named in honor of him in 1906. He also served as president of the Georgia Agricultural Society. Prior to his death on July 31, 1930, the University of Georgia conferred the honorary degree of doctor of law upon him in 1926. In 1972 Conner was inducted into the Georgia Agricultural Hall of Fame.